This darling invitation suite by Rifle Paper Co. (and the gorgeous San Francisco weather) have me singing spring's praises right now! Our weekend was a wonderful whirl of margaritas and Mexican food, morning sunshine and afternoons with the windows thrown wide open! Tell me, how was your first April weekend? Photo by Weddings by Two. Ohh Anna Bond...you make me swoon! Wow! Those invitations look gorgeous! I had some margaritas too- yum- first time this year. i love rifle paper company -- their style can be evoked in everything they do.. love the subtle colors to this wedding suite. Mine was so fabulous! Well, really busy but absolutely fabulous. No rain? Hallelujah! Ah, so gorgeous. I just love Rifle Paper Co. I am so happy it's April, it is actually starting to feel like spring now and it's the best! i ADORE rifle. this is beautiful! I love hand drawn art. So colorful and Springy! My weekend had one hour of sunshine, lots of rain and a ton of good food. I do love mexican and margaritas though! I'm a huge fan of Rifle Paper Co. Those are truly stunning. And those cards are adorable. oooooh you said the magic words: mexican food and margaritas! i had a little of that and a LOT of taxes. the saga continues...still not done and the appointment is tomorrow. this is a thumbs down. mexican and morning sunshine...two of my favourite things! my first weekend of april was a mix of sun and rain...typcial of a spring day in vancouver! My April has been pretty great too! Warmer weather, sun shining, green grass... I can't complain! Wonderful subtle colors on this suite, and such charming calligraphy! I had to work but I still soaked up the gorgeous weather! love that calligraphy! How could I not love this suite? It gently tells us that spring and love is in the air. Imagine receiving such a pretty wedding invite in the mail. warmer, for once! i ended up making tacos myself this weekend. should have just gone out... it's not the same. Hi honey! Your weekend sounds so funny...margaritas,uhm?!?!?! swoon!! these are soo absolutely darling!! the calligraphy on this is so lovely! dream invites. The weather was beautiful this weekend, but I couldn't enjoy it.. too much homework! Oh goodness, pretty font alert! Wow, how lovely! This is the definition of a perfect spring suite! there's nothing better than windows thrown open wide! beautiful wedding goodies. LOVE these invites! That is the next wedding task for us and it is quite daunting! our weekend was lovely, we spent the whole weekend outside and had our first bbq of the year, but margaritas and mexican food? what i would do for a little bit of those! 3 more months until we are back in california, so i suppose i just need to be patient! I'm a huge fan of Rifle Paper Co.
Oh it's such a gorgeous suite!! Rifle is honestly the most darling paper co ever. Even the enveloeps are incredible! 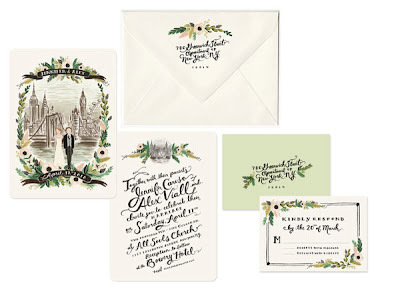 rifle paper co.'s invites just make me want to get married all over again!!! and this weather isn't helping my wedding fever either :) its too beautiful to be true! I adore her work... it's just gorgeous!! And this is no exception!